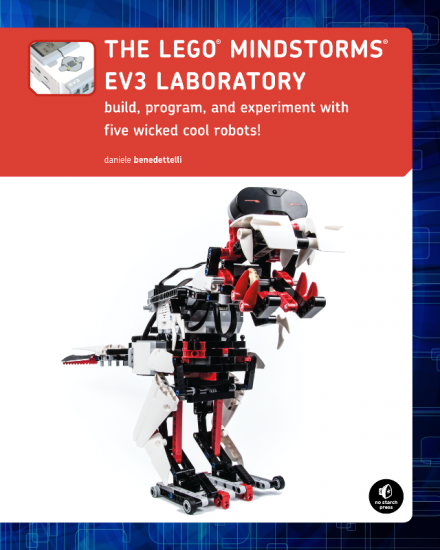 The LEGO Mindstorms EV3 Laboratory is one of the best books about Mindstorms that I have found and not because of their robots but because of their great recipes and lovely ideas. Well played. I have recently been reading a new book about LEGO Mindstorms EV3 written by Daniele Benedettelli and my eyes have been opened with it. The book is made of sixteen chapters that introduce robotics’ topics and then show you how to build the five proposed robots. First chapter is an introduction the LEGO Technic system mostly were Daniele introduce the common part names so you can continue reading the book on a common language. It has a brief description of the Mindstorms EV3 but nothing serious. The best is to come. Then we have a second chapter where we are just pushed towards building our first robot: Rov3r ( seriously guys! Can you check your keyboard? Looks like the e key is broken for you all ). So what better way of learning to build a robot that by building six of them. 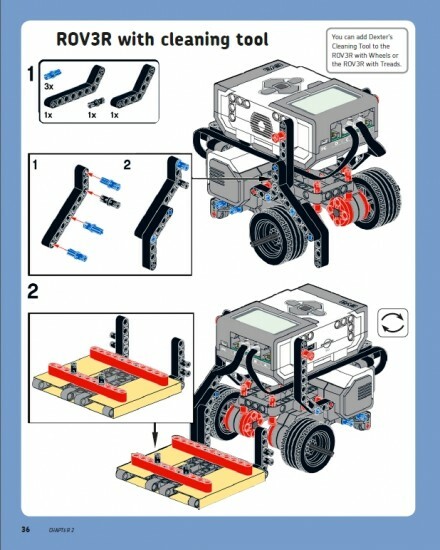 The instructions are quite clear and in my opinion simpler and better than LEGO counterparts. I built some of the robots on my own and they are both curious and really enlighten you into how to build and program the robots. I had many ideas that I didn’t know how to begin and building some of them really let me develop the idea into shape. This is a bouncer robot based on Rov3r ( that I coded myself on my own ). And this is a Proportional Wall Follower ( again, coded on my own ). Chapter 5 is about the EV3 software. It is a good guide but there is nothing there that you couldn’t learn using the EV3 guide or this article I wrote. The only part really interesting is some recipes to move a precise amount of centimeters and to turn a precise amount of degrees. Next chapter introduces sensor blocks and data wires and gives a few tips about how to debug the EV3 programs. Next chapter introduces the Math block and I have to say that without being spectacular it has been awesome to know about it. I was used to code using NXT-G Math blocks and it was a real pain to do the most basic operations because you need lots of blocks but with EV3 the Advanced mode of the Math Block fix it. Then to end the chapter Daniele introduces the P-Controller to the Wall Follower, it is pretty much the same principle used in Line Following. And well, this is my favorite chapter of the book, Chapter 8: LEGO Recipes. 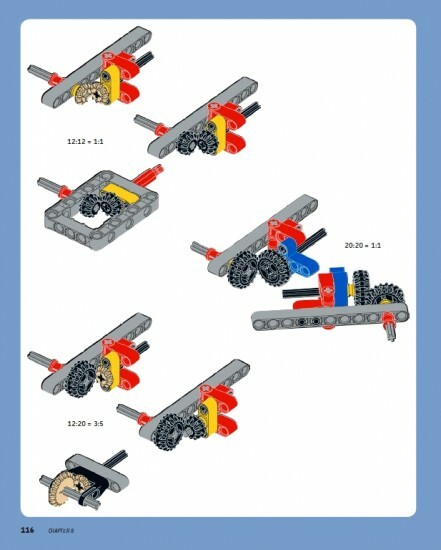 One of the biggest problems that LEGO Technic has in my opinion is the step learning curve… it is so hard start building something on your own… these little recipes let you start building on your own. First introducing the triangle as a way of building stronger LEGO models ( I didn’t know this one ), then tricks to extend beams and to brace them. For me the bracing technique has been most enlighten. I have tried several times to build my own robots or Technic models and they always fall appart and it was because I didn’t applied bracing to some key parts. The the part about how the change the direction of building has been like watching light for first time… how many times I tried to that and failed. Really , if you can read only one chapter of this book make sure it is chapter 8. Then gears, another point of frustration for me. I have a box full of gears and it looks like there is no way to mesh two of them together. Always they are or too big or too small. Well, in this chapter you have that explained and several examples about how to build with gears, gear trains and different types of motion transformations using gears. Priceless. Now the book enters into building robots. So let me explain you what you can learn from each robot instead of going chapter by chapter. First robot is Watchgooz3, a robotic goose that walks over two legs and that can patrol and guard a room. With Watchgooz3 you will learn how to build biped robots, how to make sturdy structures using bracing so they can hold gears and how to use geared down motors. This robot introduces also the concept of Center of Mass and how to use it so that the robot can maintain the balance. In the programming side of the robot you will learn how to use My Blocks and how to create your own blocks. This is an evil looking sport car and an accompanying remote control. The car uses 2 large motors for propulsion and one medium motor for steering. The building of the car is quite interesting, nothing to do with other LEGO cars and really not the best way of building a car but it is amazing what Daniele got using just a single EV3 kit. The remote is also an excellent piece of art. I am not really sure it is worth the time to get it designed and built but it is a great way of turning the standard LEGO remote on something better looking. In the programming side, first you are introduced on the steering concept and how cars really turns. Unfortunatelly EV3 comes with no differential so the only way of correctly steering the car is using an eletronic differential so that effectively turns the wheels at different speeds. You will also learn about variables, arrays, switch blocks and parallel execution threads. It is a robot that resembles a Star Wars robot that appears on Episode I ( sorry, no clue about its name… as I have already told I am not that fan of Star Wars ). This robot teaches how to turn rotations into linear motion and how to build diagonally with the LEGO Technic parts. It has quite a few interesting techniques that worth your time in my opinion. I will perhaps build this one soon on The Technic Gear and share with you my experience. On the programming side, this model features file access and random block. Different way of building a biped robot like Watchgooz3. This is a really awesome robot and I am still surprised that it can be done on a single EV3 kit. Simply awesome. The robot can walk around and has a jaws that can be closed and opened at will. On the programming side, it really gets crazy about My Blocks and you will also learn state machines and timer events with EV3. Really, if the robot building part is awesome, i can’t say less about the programing. A must-read chapter.